According to almost all estimates, the long-term trend for copper prices points upward, and current market conditions, a pullback from recent highs, marks a potential entry point for smart money investors. The fundamentals of the copper market going forward remain intact, despite near term uncertainty and lower prices driven mainly by trade war fears and the end of labor problems at BHP’s Escondida copper mine in Chile, the world’s largest supplier. London Metal Exchange copper futures have trended lower since reaching their peak for this year so far in early June, down almost 16 percent during a period that coincided with the ramping up of tariffs by the United States, coupled with increasingly bellicose rhetoric. China’s appetite for imported copper has yet to falter, with first-half imports of unwrought copper up 16.3 percent from a year ago, according to Chinese customs data. The rate of growth in the first half exceeded the 3.6 percent increase in imports of copper in the first half of 2017, showing that not only is China importing more of the industrial metal, it’s doing so at a faster pace. The reasonable conclusion here: falling copper prices are being driven by fear, not fundamentals. Eventually, that sentiment will change, and when it does copper prices are set to soar. There are a number of reasons behind the optimism for copper’s longer term price—the most obvious of which has to do with technology, a post carbon economy, and broad market adoption of electric drive trains in vehicles of all types. All of this adds up to forecast sustained, growing demand. All by itself, the growing number of electric vehicles hitting roads is set to fuel a nine-fold increase in copper demand from the sector over the coming decade. That will move the sector’s consumption from one percent to six percent of all copper produced in the world within a decade. “Demand for electric vehicles is forecast to increase significantly over the next ten years as technology improves, the price gap with petrol cars is closed and more electric chargers are deployed,” IDTechEx Senior Technology Analyst Franco Gonzalez said in a recent report. “Our research predicts this increase will raise copper demand for electric cars and buses from 185,000 tonnes in 2017 to 1.74 million tonnes in 2027,” Gonzalez said. Electric vehicles use a substantial amount of copper in their batteries and in the windings and copper rotors used in electric motors. A single car can have up to six kilometers of copper wiring—nearly four miles. Cars that run on internal combustion engines use up to 23 kg of copper each. A hybrid electric vehicle uses nearly double that amount at 40 kg of copper, and a plug-in hybrid electric vehicle uses 60 kg—about 130 lbs. An electric bus can use between 224 kg and 369 kg of copper in batteries—that’s more than 800 pounds of copper per bus. What that points to is this: in the next decade, global copper demand will increase between three and five million tonnes annually. Once electric vehicles become popular, forecasters estimate demand to reach 11,000,000 tonnes of new copper for EVs alone, with potential upside in other green technologies, including charging infrastructure. According to the British consultancy CRU, demand for copper in charging and distribution upgrades will reach at least 1.2 million tonnes annually by 2035. But growing demand goes way beyond the EV market. Take a look at a recent report from BMO Capital Markets that states major copper demand will stem from solar and wind power installations, both of which are copper intensive. “Our research shows that renewable energy is the largest single driver of copper demand growth over the coming years, owing to the need to connect significant numbers of small-scale electricity generation units into the grid,” the report states. BMO projects that due to copper’s importance in both solar and wind energy, demand is expected to grow at a double-digit compound annual growth rate over the coming years. In particular, solar panels alone are expected to add 2.5 million tonnes per year to copper demand. All great, right? But there’s one big problem. Copper supply is not keeping up. That’s the simple truth. 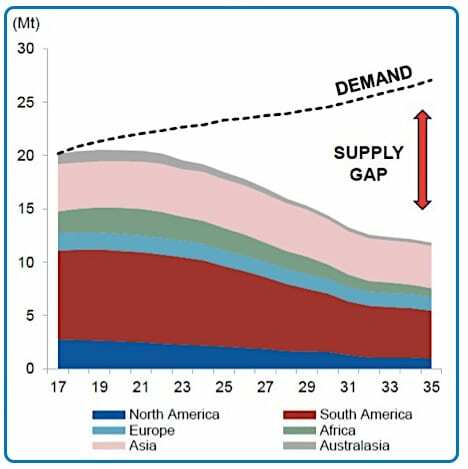 The supply deficit could surpass 900,000 tonnes in 2021 and 2022, according to BMO Capital Markets, as supply growth slows due to deteriorating ore grades in major producing countries, lack of new significant discoveries, and very low investment in exploration. Consultancy McKinsey Global Institute has singled out copper as a commodity for which demand could grow strongly over the next two decades, mainly because of Chinese growth and its importance to electric vehicles and wind- and solar-energy. Moreover, the group has also predicted that supply would be constrained by the depletion of copper ores after 2025. The potential supply shortage and upward price pressure is readily visible in current mine production stats. Net cash cost at mines globally in 2017 is about three times the levels in 2000, while the copper ore grade at mines in Chile, the world’s largest producer, has declined by 0.76 percent, down to 0.65 percent in 2016, from 1.41 percent in 1999. Of the 20 biggest copper mines globally, only four have begun production in the 21st century. 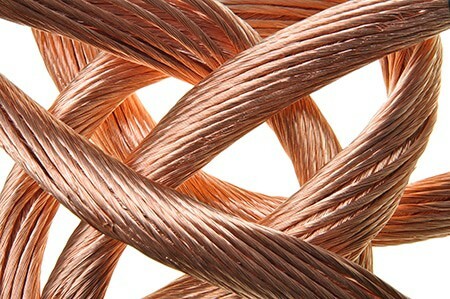 According to a study by Bloomberg, a deficit in copper is likely to emerge around the year 2020. Despite the fact that the current project pipeline will add new supply in the short term, the long-term trends show a less rosy picture for copper supply. Supply of copper from new projects will peak, and will fall away dramatically as we move towards 2020. Bloomberg still sees the possibility of expanded production from existing mines, but after 2020 there really is no more flexibility. There’s plenty of good news for copper investors. Copper’s recent slump amid a deepening global trade conflict offers a long-term buying opportunity, according to Citigroup Inc., which shrugged off fears for world growth to boost its long-term forecasts. “Prepare for a decade of copper on steroids,” analysts including Max Layton and Tracy Liao wrote in a July 17 note. The bank sees average annual prices at $8,000 a metric ton in 2022, passing $9,000 a ton by 2028 under its baseline scenario. Citigroup’s forecasts from 2023 are based on a new long-term price level of $7,500 per ton, assuming 2.0 percent annual inflation. That’s up from an earlier outlook of $7,000 a ton, the bank said. Citi’s bullish outlook coincides with other analysts and miners who see a supply shortage looming as infrastructure demand from urbanization, and the rise of renewable energy and electric vehicles, boosts the world’s need for the metal. Demand growth will average 2.7 percent a year through 2030, with new energy sectors and EVs contributing most of the increase, according to Bloomberg Intelligence. The market is entering a long period of deficits starting this year, Citigroup said. Citigroup added a note of caution for the near term in its report, observing that if a full-blown trade war does materialize, copper will fall “materially lower before it goes higher again.” Still, that’s not the bank’s base case, and copper should find a floor near current prices as high-cost mines come under pressure in the low $6,000 range, it said. Shares in Southern Copper Corporation (NYSE: SCCO) have fallen below the $45 level having reached peaks of $53 per share in June 2018. SCCO is one of the largest integrated copper producers in the world. The company produces copper, molybdenum, zinc, lead, coal, and silver. Mining, smelting and refining facilities are located in Peru and Mexico, and the company carries on exploration activities in those countries and Chile. Freeport-McMoRan (NYSE: FCX) operates large, long-lived, geographically diverse assets with significant proven and probable reserves of copper, gold and molybdenum. FCX is the world’s largest publicly traded copper producer. FCX’s portfolio of assets includes the Grasberg minerals district in Indonesia, one of the world’s largest copper and gold deposits, and significant mining operations in North and South America, including the large-scale Morenci minerals district in Arizona and the Cerro Verde operation in Peru.Shares in FCX have below the $14 level from June highs in the $20 range—a 30 percent decline. Rio Tinto’s (NYSE: RIO) stock has been beaten down from highs of $57 to current levels of $46, a nearly 20 percent decline since peaks in June, before recent recovery to the $50 range. The company operates through five product groups: Aluminum, Copper, Diamonds and Minerals, Energy, and Iron Ore. The Copper product group produces copper, with valuable by-products of gold, molybdenum, silver and nickel. On the junior exploration and development side, Oroco Resource Corp. (TSX-V: OCO / OTC: ORRCF) is focused on the assembly of the mineral concessions which make up the Santo Tomas porphyry copper project in Sinaloa State, Mexico. To date, Oroco has formally acquired a controlling interest in three mineral properties that abut and surround the concessions which cover the known core of the Santo Tomas mineralized structure, and is currently in the process of negotiating the acquisition of the entity that has contractually acquired the core concessions. Taseko Mines Ltd. (TSX: TKO / NYSE American: TGB) is a copper producer operating in Canada and the U.S. The company’s flagship asset is the Gibraltar Mine, which is an open-pit, copper-molybdenum mine located in south-central British Columbia, Canada. The mine is expected to produce 140 million pounds of copper and 2.5 million of molybdenum in 2018. The company also owns the New Prosperity gold-copper, Aley niobium, Florence copper and Harmony gold projects.Share prices have dropped precipitously this year from the $C3.00 level to current market just under $1.00. While production is solid, copper prices have at least temporarily had an impact on share price, and Taseko reports that costs at Gibraltar have risen the last couple quarters. Put it all together and you can see the opportunity in copper, and the wisdom of taking advantage of current market conditions to evaluate copper investment opportunities, and position yourself accordingly. Hey Buddy!, I found this information for you: "Copper’s Electrifying Outlook". Here is the website link: https://financial-news-now.com/coppers-electrifying-outlook/. Thank you.